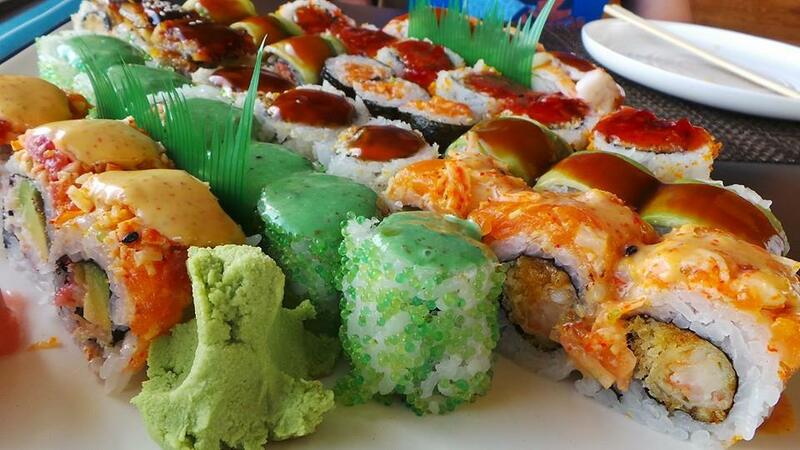 Who doesn’t love a tasty plate or set of Sushi? To be honest, it is hard to find the perfect Sushi to have in Amman. You will also probably end up paying big bucks to have some of the best Sushi in Amman. Luckily, The Spotist has reviewed, what we believe is the top 5 Sushi restaurants in Amman. Bon Appetit! Salad House, located in Abdoun (opposite to Fitness First and right across Housing Bank Park), offers Sushi on selected days of the week with prices that won’t let you go broke! Their Sushi is truly satisfying. It is definitely not the best I have ever had, but it is excellent to satisfy my taste buds, especially when I AM CRAVING SUSHI! Also, they tend to offer a limited set of Sushi types, and you might not find anything TOO special here. Salad House offers a casual dining experience with a very friendly staff who are ready to satisfy your Sushi needs with their fresh-prepared Sushi. Consider eating at Salad House whenever you feel like having Sushi in a casual outing or for delivery and takeaway (although I suggest eating Sushi straight out of the knife!). Nevertheless, I truly enjoy eating their Sushi and would definitely continue to visit Salad House. Alcohol is not served on premises. The Lettuce and The Fish also offers a casual dining experience for Sushi lovers. Situated in Abdoun, in the same complex as Fitness First Gym. This restaurant shares 2 Asian dining experiences, Sushi and Chinese. With 3 days of All You Can Eat Sushi at JOD20++, this place is not pricey! Their Sushi is decent, and their environment is nice. Also, if your dining partner does not eat Sushi, they have plenty of other options to offer them. I love their friendliness and service, super-fast and efficient. You know, because every time you go to a Sushi place its like your saliva is having a marathon with your tongue and you just want to eat right away! Their Sushi selection also tends to be limited, I have not found anything that is too special or unique here. But it is satisfying enough for a casual dining experience. Alcohol is served at The Lettuce and The Fish to compliment your sushi selection (we apologize for mentioning before that alcohol is not served as it was a mistake). I LOVE LOVE OOBE! The experience of being in that place is just amazing. It combines that of a pub, with a lounge, with a restaurant. It is just a combination of everything and it is amazing! Oobe (or what they say is Out Of Box Experience) offers Sushi 1 day a week. I believe it was Saturday, which is their Sushi and Wine Day. Located in Shmeisani, Oobe is part of the ATICO Fakhreldin Group which runs several restaurants and divisions. In the same building they also offer a complete Sushi dining experience in Vinaigrette, the number 1 spot in this review (Read Below)! Although I am sure the Sushi offered at Oobe is pretty much the same as that of Vinaigrette, it is still worth being mentioned here due to the wonderful experience and environment you will certainly enjoy at Oobe. Oobe usually have a live band, or a DJ playing the night, which is perfect for a group outing or even a date. They serve some of the best Alcohol in town! So many delicious cocktails, and wine menu that will not disappoint you. They also serve a menu of international food that is mouthwatering. Oobe will definitely not disappoint you! Yoshi my dear good friend! I truly truly love you. Where should I start from? Yoshi is a beautifully designed restaurant, with a summer balcony that offers privacy from busy streets. Located in Jabal Amman (between 4th and 3rd circles), Yoshi offers a Sushi Dining Experience that will make you crave for even more Sushi. It’s like you can’t ever get enough of it! The Sushi variety they offer is delicious in every aspect. It might take you a while to understand their menu, but once you do, boy oh boy, get ready to go crazy and start ordering everything! Their Salads are a perfect beginning to the delicious journey you are about to embark on. Try their Crunchy Salmon Salad (which I believe is not on the menu), and their Chicken Peanut Salad (or Peanut Chicken Salad). Their wine list is also pretty decent, and contains a variety of wines which are perfect to match with your Sushi order. Yoshi also offers a food happy hour from 5pm-7pm every day with a special discount of 25% on your bill. If you plan to visit outside the happy hour, know for sure that you will be paying a generous amount of money on your bill as it is relatively expensive. My only comment regarding Yoshi, is their service. Food takes forever to arrive at your table! If you are hungry and looking for a quick business break, this might be a problem. I have always complained about the slowness of the preparation of the food, and even the drinks, with no use. Regardless, it is one of my favorite Sushi Spots in Amman and one of the most delicious. Last, but certainly not least, is Vinaigrette. Another famous ATICO Fakhreldine Group division which specializes in Sushi. Located in Shmeisani, on a beautiful rooftop that overlooks Amman, this restaurant is stunning! With a wonderful set of Sushi Menu that is made to order, and a beverages menu that will not go wrong, you are about to enjoy every second of your meal. Vinaigrette carries a Sushi menu that will certainly satisfy your Sushi Needing Taste Buds! They also offer some other sea food varieties, including my favorite Black Mussels and Seafood Platter. Don’t forget to order their famous Kani Salad, it is a must-have! Vinaigrette is open for both Lunch and Dinner which will let you enjoy their day and night views of Amman. You can never get enough of it! I truly recommend that you visit Vinaigrette on your next Sushi Craving to experience what I am talking about. I cannot describe the taste of the delicious Sushi, but all I can think about right now is running to Vinaigrette for some; saliva is swirling in my mouth and I need Sushi now! Let me know what your favorite Sushi place in Amman is, and feel free to comment in the section below. Would love hear your feedback. Previous articleJordanians Can Travel to 44 Countries Without a Visa!